I am so excited that one of my favorite events of the year is nearly upon us! Since 2014, the masterminds behind OC Brew Ha Ha have put together an epic event which combines amazing beer, tacos, live music, and luchadores! You can read about my experiences at Sabroso in 2014 and 2015. This year's third annual Sabroso Craft Beer & Taco Festival will once again be held at the picturesque Lake View Park near Irvine Lake. I love this venue, because it is close enough to the major freeways in the area, yet far enough out of the way to make it feel as if you are not near a major metro area, like Orange County. The event will be held on Saturday, April 30th from 12 p.m. to 4 p.m.. There will be a wide variety of unlimited tastings of over 100 craft beers as well as the opportunity to purchase $3 gourmet tacos from some of the best chefs and restaurants in Orange County. The chefs and restaurants will all be competing for the coveted People's Choice awards, so these tacos will not be your average ones. Chef Octavio Montoya of Stadium Brew Co. Along with beer and tacos, Sabroso also offers great entertainment such as live music and Lucha Libre wrestling. The wrestling is always one of my favorite parts of the events for me! A portion of the proceeds from Sabroso will benefit the Big Brothers and Sisters of Orange County and Inland Empire. As one of the top mentoring organizations in the country, they have changed the lives of thousands of local children each year since 1958. For more information, visit: https://www.ocbigs.org/. New for this year's event is that Sabroso is offering free shuttle service from the event to the Tustin Market Place from 3:00 p.m. to 5:30 p.m.. This service is being offered to help improve the experience for guests who take alternative transportation to the event. While it isn't a problem to take alternative transportation modes TO the event, afterwards it is very difficult for drivers to pick up guests. The shuttles will take guests who did not drive to Sabroso to an area where it will be much easier to get a ride from a Lyft, Uber, taxi, etc.. The shuttle is a free service. Donations are welcome for the service, 100% of the donations will go to Sabroso's charity partner, the Big Brothers and Sisters of Orange County and Inland Empire. Tickets for Sabroso are $55 online in advance. If the event does not sell out prior, tickets will be available at the door the day of the event for $55. Designated Driver tickets will be available for $20 at the door only and must be accompanied by a paid ticket holder. No one will be admitted who is under 21 years of age. Tickets for this year's Sabroso Craft Beer & Taco Festival are now on sale and can be purchased at: https://www.eventbrite.com/e/3rd-annual-sabroso-craft-beer-taco-festival-tickets-21174609828. 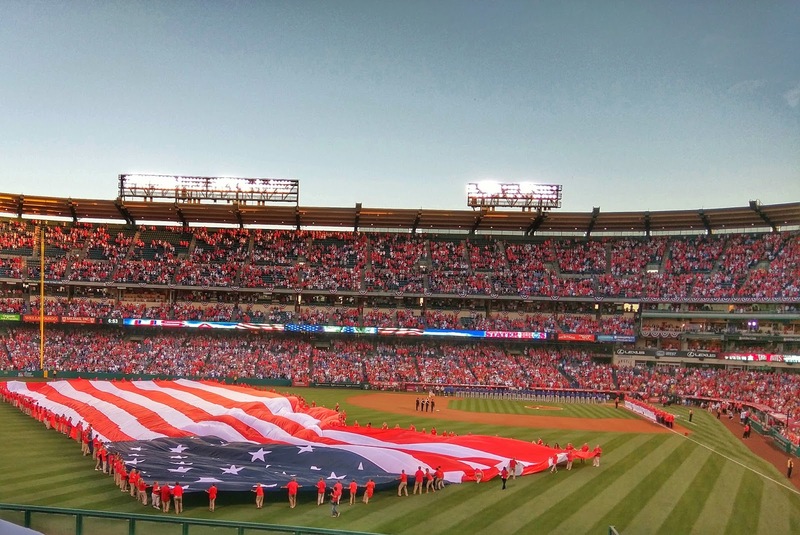 Opening day of MLB is one of my most favorite days of the year, right after my birthday and Christmas. 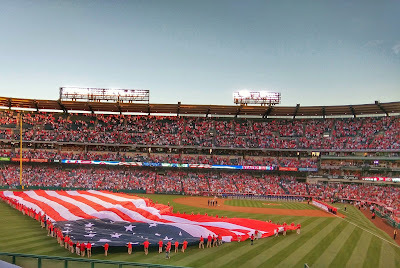 This week, I was able to return to one of my most favorite places on Earth, besides San Diego and Disneyland, Angel Stadium. Going to games at the Big A with my friends is one of my most favorite things to do, besides of course visiting new breweries. For the past three (!) 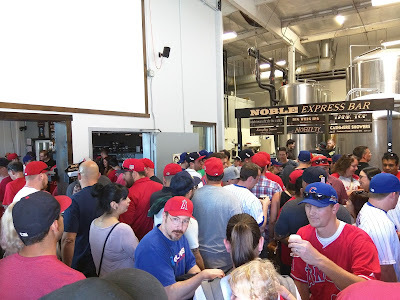 years, I've written about the craft beer available at the stadium on my blog. It's been amazing to see new and familiar breweries each season at the stadium. 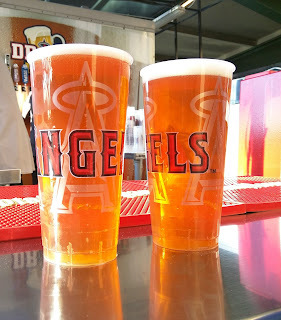 Going to the Angels home opener is always fun for me, because I love baseball but it's also great to have a chance to check out the newest craft beer options at the stadium. Before heading to any game at the stadium, I first stop off at one of my favorite local breweries, Noble Ale Works, which is located just north of Angel Stadium. Enjoying a beer at Noble Ale Works before walking over to the game is a fantastic way to support a local brewery before supporting my local baseball team. Going to Noble before a game is also a great way to save a few bucks on parking and save some money for purchasing beer at the stadium. On busy days at Noble Ale Works, the Express Bar is open, where the line is usually shorter. 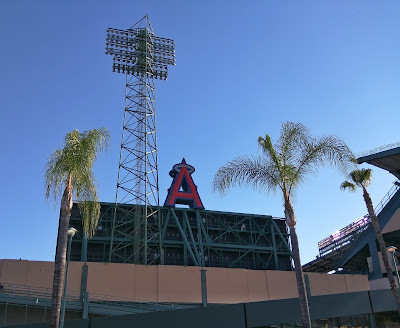 As it has been for the past few years, the location at Angel Stadium with the widest variety of beer is also closest to the entrance of the stadium. 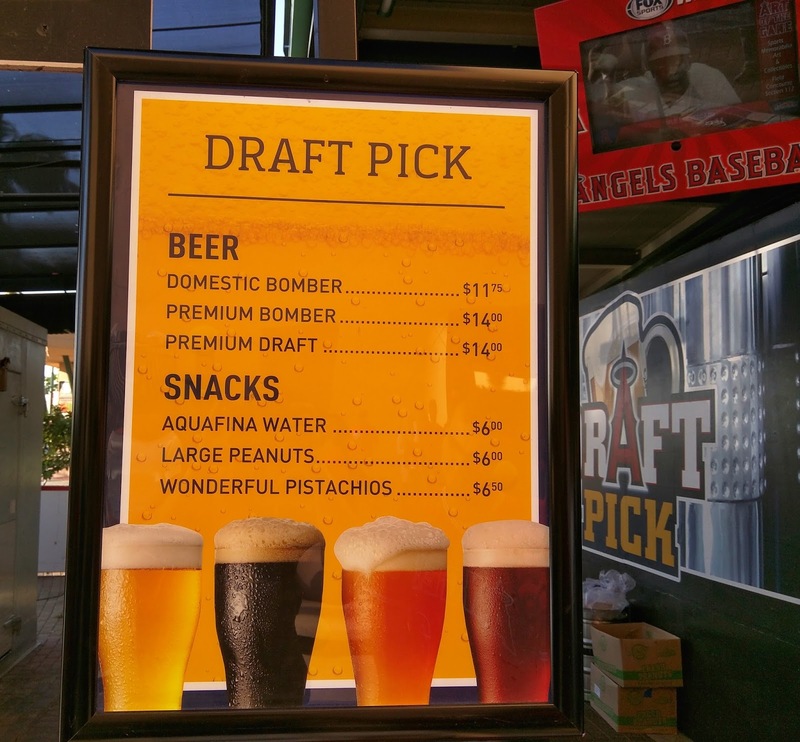 Located near Gate 2, Draft Pick once again has the largest variety of beer choices in the stadium. Domestic Draft prices are $4.50 for a small and $9.50 for a large, while Premium beers are $11 for a small and $14 for a large. Two stand alone carts, which first debuted last season are again on the 200 level of the stadium. 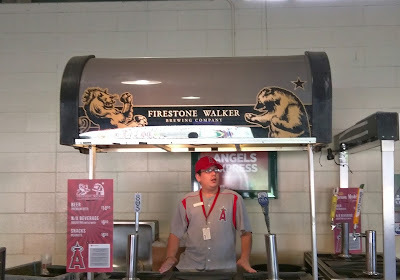 The smaller of the two carts has Firestone Walker options and is located near section 204. The larger stand is located near the Left Field Pavilion, not far from section 256. The new larger stand has most of the same beers available at the Draft Pick stand as well as a few macro selections and ciders. 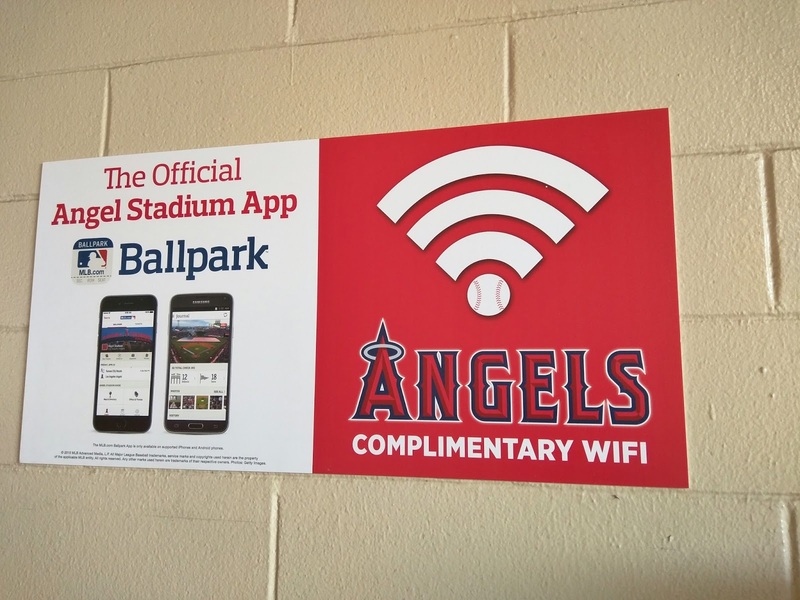 I was pleasantly surprised to see that this season Angel Stadium offers free wi-fi throughout the stadium. This makes it far easier to keep in touch with friends throughout the game, and of course post essential social media updates. While Angel Stadium has boasted about having the lowest cost per ounce of beer in the MLB in the past, their price of beers has increased again this season. For $14, you are able to enjoy 24 ounces of craft beer, which equates to $0.58 per ounce versus $0.39 per ounce for macro styles of beer. 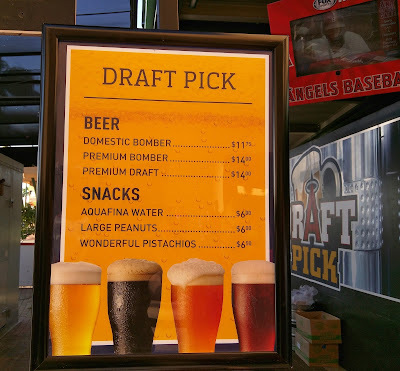 While the price per ounce is nearly double the average of $0.31-$0.37 per ounce from nearby breweries, the price is still fairly reasonable for a sports venue. 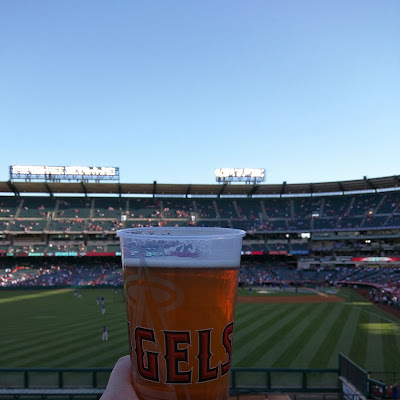 While the previous two seasons saw an increase in the number of craft breweries having their beers available at Angel Stadium, this season actually has seen a decrease. The average consumer may not notice, but many of the breweries in the past season that were previously craft breweries are no longer craft. 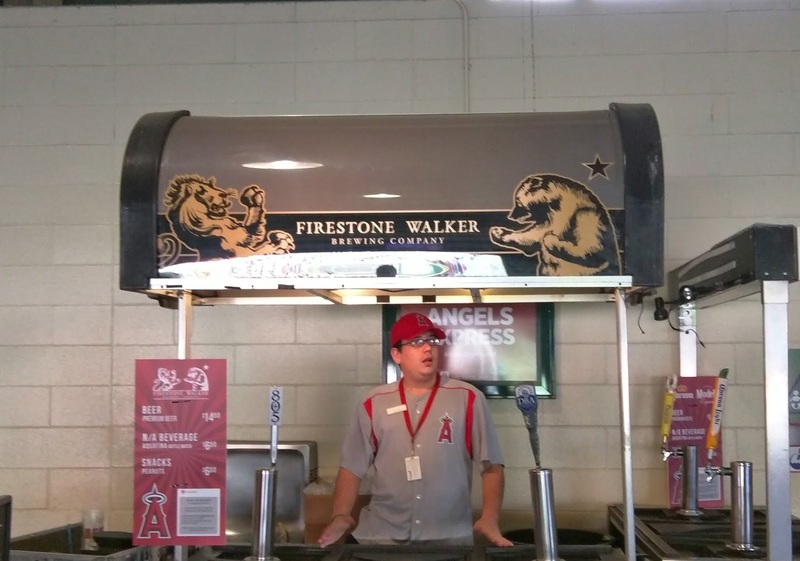 I'm glad that one of my favorite local breweries, Left Coast Brewery, has continued to have a presence at Angel Stadium. 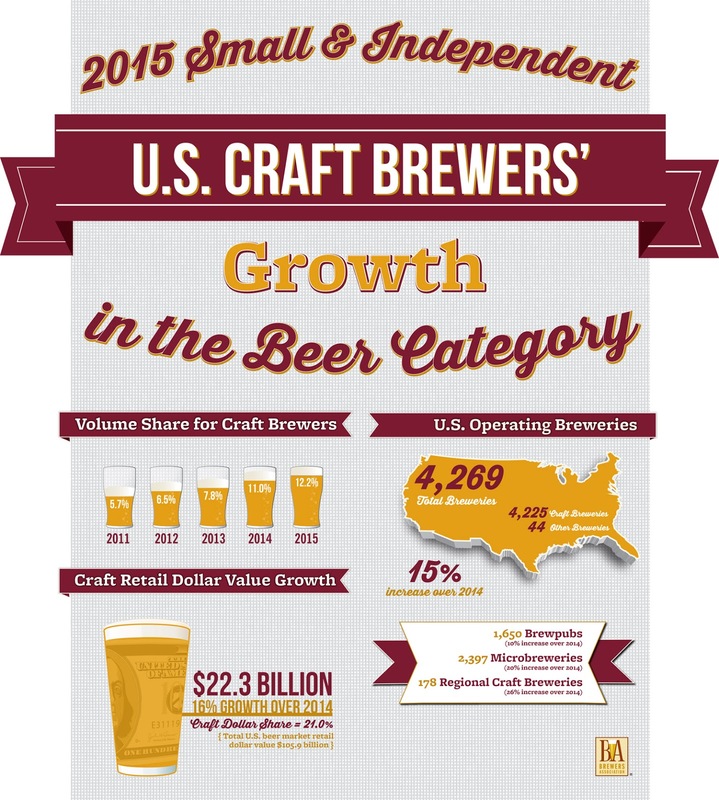 Boulder, CO--The Brewers Association (BA), the trade association representing small and independent American craft brewers, today released 2015 data on U.S. craft brewing2 growth. With more breweries than ever before, small and independent1 craft brewers now represent 12 percent market share of the overall beer industry. "For the past decade, craft brewers have charged into the market, seeing double digit growth for eight of those years," said Bart Watson, chief economist, Brewers Association. "There are still a lot of opportunities and areas for additional growth. An important focus will remain on quality as small and independent brewers continue to lead the local, full-flavored beer movement." 2,397 microbreweries, 1,650 brewpubs, and 178 regional craft breweries. Throughout the year, there were 620 new brewery openings and 68 closings. One of the fastest growing regions was the South, where four states--Virginia, North Carolina, Florida, and Texas--each saw a net increase of more than 20 breweries, establishing a strong base for future growth in the region. "Small and independent brewers are a beacon for beer and our economy," added Watson. "As breweries continue to open and volume increases, there is a strong need for workers to fill a whole host of positions at these small and growing businesses." Note: Numbers are preliminary. The Brewers Association will release the list of Top 50 craft brewing companies and overall brewing companies by volume sales on April 5. Additionally, a more extensive analysis will be released during the Craft Brewers Conference & BrewExpo America--in Philadelphia from May 3-6. The full 2015 industry analysis will be published in the May/June 2016 issue of The New Brewer, highlighting regional trends and production by individual breweries. 1An American craft brewer is small, independent, and traditional. Small: Annual production of 6 million barrels of beer or less (approximately 3 percent of U.S. annual sales). Beer production is attributed to the rules of alternating proprietorships. Independent: Less than 25 percent of the craft brewery is owned or controlled (or equivalent economic interest) by an alcoholic beverage industry member that is not itself a craft brewer. Traditional: A brewer that has a majority of its total beverage alcohol volume in beers whose flavor derives from traditional or innovative brewing ingredients and their fermentation. Flavored malt beverages (FMBs) are not considered beers.